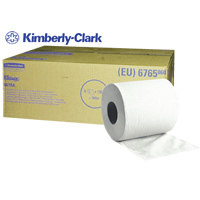 Hand towels on high-capacity rolls that control how much tissue you take and help cut costs and waste. Ideal for: food contact areas and busy office and hotel washrooms that have a high-quality image; providing a luxury feel; drying your hands quickly and comfortably with fewer towels, as they£re strong and highly absorbent without breaking up when wet; keeping maintenance costs down, with less frequent refilling. Available as: 130m rolls of white, soft 2-ply hand towel that£s made from strong, highly absorbent AIRFLEX* fabric, safe for food use and FSC-certified.